25mm of pure rebuildable beauty, featuring a 2ml juice capacity well for the vaper who enjoys pushing the watts onto their coil. The Lynx 25mm RDA by Digiflavor features a durable design and a clamp style system that relies on spring loading to keep your coils snuggly mounted. Choose between mouth to lung or direct to lung with the simplest of ease. Reach flavor nirvana with any build you mount to this rebuildable dripper atomizer as it was intended when the foundation of its design were laid. The brand name Digiflavor tells you everything you need to know about what experience is to be found with with RDA. 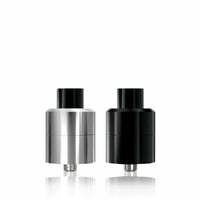 Digiflavor Lynx 25mm RDA - Digiflavor has a rating of 4.7 stars based on 7 reviews.